Spray painting the face of a drawer can be tricky and messy. 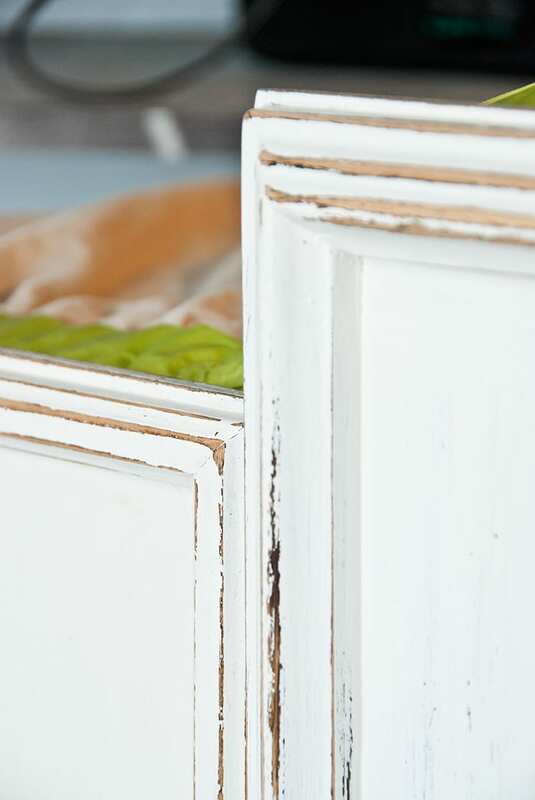 When unwanted paint gets on the inside or sides of a drawer, it looks sloppy and may even hinder a smooth glide. In a perfect scenario, 100% coverage would be achieved by leaving the drawers IN the furniture while spray painting the entire piece. If only it were that easy, right? I don’t know about you, but in MY reality, I often need to take the drawers out, then spray paint them separately to get the perfect coverage. Here’s my quick & dirty way to keep drawers clean while spray painting. b) no worries… fitted sheets are readily available at garage sales or thrift stores for .99 cents! I set up my drawers side by side or stack them one on top of another so the entire face is exposed. Then I wrap the fitted sheet around the parts of the drawers I DO NOT want spray painted. The elastic on the fitted sheet makes it easy to wrap around the drawer corners. Tuck the sheet under, and the weight of the drawers holds it in place. In this case, I had 2 short drawers and 2 tall, so a little bit of painters tape came in handy. The sheet can be used over and over again. I always give it a good shake in-between uses to ensure no particle dust messes up my next project. 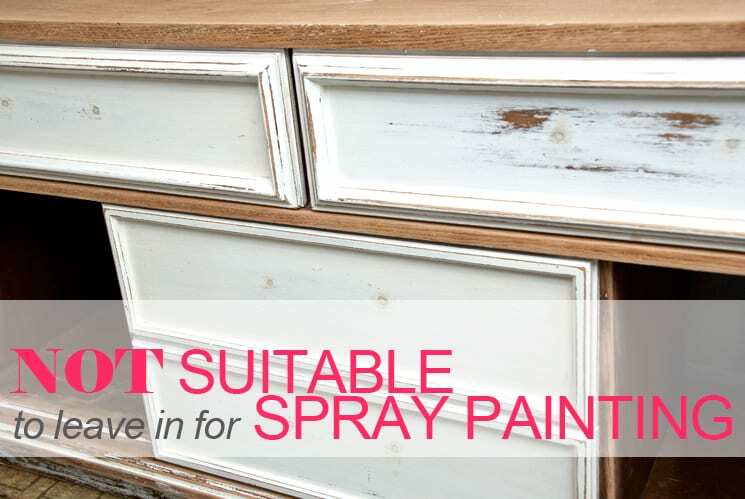 Do you have any tips and tricks for spray painting drawers… chime in because I’d love to hear them! Previous Post: « I’ve Been Featured! Thank you for the fitted sheet idea. I bought a wonderful Dorothy Draper-esque desk for $100 on Facebook Marketplace. I plan to spray paint it, but have never sprayed case furniture before – only more open tables and chairs. This is a perfect solution to the drawer problem! Fabulous! And I’m glad to know we can still be friends!! Martha who?? This is a great idea:) I really enjoy your FB page, and follow the links to your blog! I haven’t used a sprayer yet.. but am now so busy, am considering it:) What kind of sprayer would your recommend? Hi Twila…Love that your following and happy to hear how busy you are! I use the Husky Spray Gun (Home Depot) and LOVE IT! https://salvagedinspirations.com/free-husky-hvlp-paint-gun-is-on-route/ Several months ago, when I spoke to a Home Depot rep, they said they were going to bring it up to CanadianHD Stores within the year. I still haven’t seen here but you can try ordering it on-line.